The item Between the lies, (ebook) represents a specific, individual, material embodiment of a distinct intellectual or artistic creation found in Charlotte Mecklenburg Library. When does the End Zone Justify the Means? The Los Angeles Leopards and the Portland Pioneers are on a collision course toward the Super Bowl Championship. One team is led by a take-no-prisoners head coach; the other by a cerebral, slow-and-steady coach who has been thrust into the spotlight because of a tragedy. A tense showdown is about to unfold before the world's football fans. But along the way to the championship game, something bad happens: the very integrity of the game comes within a yard of ruin! 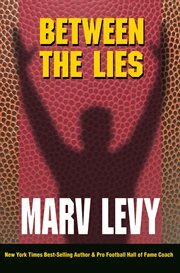 In his thrilling new work of fiction-Between the Lies- Hall of Fame Coach and New York Times best-selling author Marv Levy takes us on a journey through the NFL like we've never seen before. Through the eyes of a memorable cast of characters, many of whom are based on real football players, coaches, general managers, and owners, we get to see professional football from the inside. And we get to see the game's underbelly, where rules are bent or broken, lies are used as promises, and the integrity of the game hangs in the balance. Between the Lies is filled with the kind of intimate knowledge that only a Hall of Fame coach could possess. It is a must-read for fans of the NFL and for all of us who ever wondered what goes on the inside the sanctity of the locker room. This book, of Sports Fiction, follows Coach Levy's New York Times Best-Selling autobiography-Where Else Would You Rather Be? Marv's infectious personality shines through every page. You will laugh out loud, curse out loud, and cheer out loud!